Last week, the Toronto International Film Festival announced some of their big galas and premieres. There were some interesting films listed, but the real excitement came today, when they unveiled the Midnight Madness, Vanguard, Masters, and Documentary programmes. These are the films that are less likely to make headlines, but are some of the best, most interesting, and craziest movies at the festival. Here are a few films that jumped out of the lineup so far. This is by no means definitive, and at times totally subjective and irrational. There is a reasonably possibility that some of them will not be very good. The ragtag crew of a fishing boat takes on a dangerous commission to smuggle a group of illegal immigrants from China to Korea, in this tense high-seas adventure co-scripted by South Korean genre-movie guru Bong Joon-ho. TIFF usually lands some fun Korean films, and a script credit by Bong Joon-ho just seals the deal. Julianne Moore, Mia Wasikowska and Robert Pattinson star in this acidulous vision of Tinseltown from Canadian master David Cronenberg. The description says it all, doesn’t it? Great cast, great director. I loved TIFF’s programme of Chinese cinema last summer, so perhaps I’m more receptive to Chinese films at the festival this year. Zhang Yimou’s made some very good films, so this is intriguing. 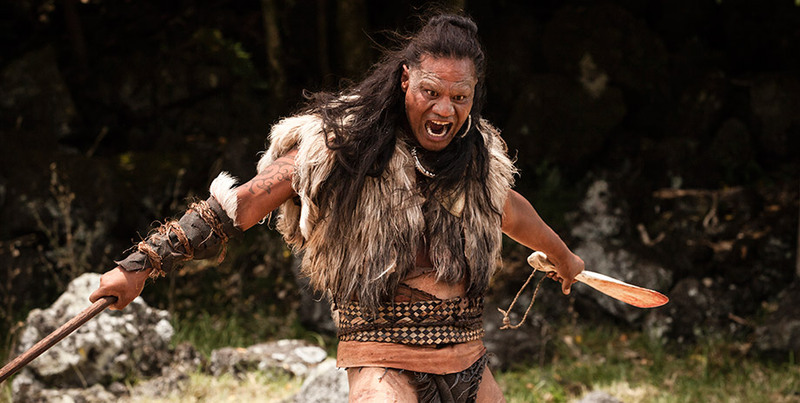 In this dazzling action epic set in pre-colonial New Zealand, the young son of a murdered tribal chieftain seeks vengeance on his family’s killers by learning the ancient Maori martial arts from a legendary warrior. Doesn’t that just sound amazing? It would sound fantastic even if I hadn’t been to New Zealand in the spring. Greta Gerwig and Brady Corbet star in the exhilarating new film from French auteur Mia Hansen-Løve (Goodbye First Love), which traces the rise of the French electronic-music boom in the 1990s. My love for Greta Gerwig knows no bounds, but in this case she takes a back seat to Mia Hansen-Løve, whose Goodbye First Love was an enchanting and beautiful film about falling in love and recovering from it. An impulsive decision in a moment of crisis drives a wedge between a husband and wife, in this gripping moral drama from provocative director Ruben Östlund. Why? I dig Scandinavian films. And the trailer reminds me of Loneliest Planet, though it takes a very different approach to the story. A frustrated middle-aged filmmaker and his wife (Ben Stiller and Naomi Watts) become enamoured of a young hipster artist couple (Amanda Seyfried and Adam Driver) in writer-director Noah Baumbach’s eagerly anticipated follow-up to the Festival hit Frances Ha. Frances Ha is one of my favourite movies of the past few years, so Baumbach’s latest obviously goes on my must-see list. I’d be more excited if it weren’t for Ben Stiller, but I like everyone else in the cast. I absolutely adored Susanne Bier’s After the Wedding, but none of her following films grabbed my attention; one of them even had Piers Brosnan in it. Second Chance looks more interesting, and you can’t go wrong with Coster-Waldau, who’s excellent on Game of Thrones, but has also done some good work on movies like Headhunter. … absurdist, surrealistic and shocking pitch-black comedy, which moves freely from nightmare to fantasy to hilariously deadpan humour as it muses on man’s perpetual inhumanity to man. A recently divorced, work-obsessed lab technician finds herself encountering a whole new world of experience when she attends an important scientific conference in Paris. Perhaps it’s lazy, but I’m just going to default to the position that I like Norwegian films. Stuck with a sexually transmitted serial haunting after a romantic night out, a beautiful nineteen-year-old girl finds herself pursued by a legion of malevolent, lumbering phantoms that will pursue her forever — unless she passes the curse on to someone else. I don’t really have a strong argument for this one, other than that it looks like an interesting twist on some horror film standards. Midnight Madness is often very dude-centric, so it’s nice to have a (possibly) female-oriented film. This is entirely a gut-feeling sort of thing, and the sort of movie that might be amazing, or might be awful. … yakuza-street gang-hip hop-musical epic. Why Don’t You Play In Hell was perhaps the ultimate Midnight Madness movie: Whether or not it’s a good movie is subject to debate, but it’s completely batshit insane and a blast to watch at midnight with a thousand other genre nuts. Accordingly, a new Sion Sono film is a must-see, particularly at Midnight Madness. I don’t really know about this one. The first [REC] was amazing, one of the very few (possibly only) found-footage horror movies I can tolerate. I haven’t seen 2 or 3, since they didn’t seem at all necessary, but I can at least appreciate that the third film took the franchise in a different direction. I don’t think this is likely to be a great film, but it does look like it might be a fun Midnight Madness movie. British filmmaker Peter Strickland follows his eerie Festival hit Berberian Sound Studio with this dark melodrama about an amateur butterfly expert whose wayward desires test her lover’s tolerance. I didn’t actually like Berberian Sound Studio all that much, but it was still a weirdly fascinating film. Renowned artist and filmmaker Dave McKean (MirrorMask) brings his distinctive blend of live action and gorgeously wrought animation to this dreamlike reverie about four people whose weekend idyll in an isolated English seaside home becomes an opportunity for spiritual healing. It’s Dave McKean. I’m unsure of how good this will be, but I am confident it will look amazing. A theatre troupe rehearsing a classic play of murder, betrayal and phantasmagorical vengeance find life bloodily imitating art backstage. It’s been a while since I’ve really enjoyed a Takashi Miike film. (Probably going back to 2003’s Gozu; I’ve heard 13 Assassins was good, but haven’t got around to it yet.) But this looks weird and creepy in a non-traditional Miike way, and may bring me back to his films.